Explore and prepare for different areas of web design, including graphics, design, coding, and formatting for search engine optimization. Prepare different types of web designs based in the needs of the client, for example business, e-commerce, informational, etc. Explore additional computer skills such as taking apart a computer and figuring out how the components work. Learn to code websites that will properly display on different media types, such as a smart phone, tablet, PC, and even print. 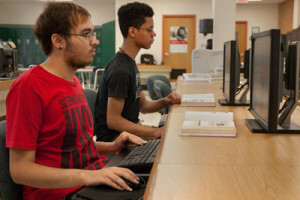 Earn college credits with the Technical Academy while still in high school. *Earn up to 24 dual enrollment college credits with Reading Area Community College through participation in the Technical Academy. I have been teaching web design since 2001. I have a love of teaching that began when I was a corporate trainer in industry and as an adjunct instructor for Harrisburg Area Community College. I then moved to public education, where I found my calling. I enjoy working with high school students and passing on my passion for web design. I stay current by keeping up with industry standards and the latest technology. Help Desk Administrator, Snyders of Hanover, Inc.
Assistant IT manager, USA Direct, Inc. IT director, York County Economic Development Corp.